From the start of the popular uprising in Syria, it was obvious that the regime’s first enemy was the non-violent movement. In this sense, one can interpret the systematic campaign launched by the different security branches to neutralize the non-violent activists through ambushes, detention, torture, and finally, for those lucky enough to survive all of the aforementioned, the persecution of being hauled in front of martial courts aimed at forcing them to leave the country at any cost. As a result, and upon the compromising of their networks, many of the non-violent activists and their colleagues, were arrested and tortured to death. The survivors chose Lebanese exile, where they sought to resume their activities and provide their forsaken fellow countrymen with logistical support from the neighboring country. At that time, most of the activities of the Syrian civil society in Lebanon were restricted to logistical support to field hospitals and media activists inside the country. They were sending medicines, satellite internet devices and cameras, organizing training for media activists, and launching in cooperation with other colleagues scattered around the world, important advocacy campaigns to raise awareness around the world of what was happening in Syria. Then the uprising was militarized, and the hemorrhage of activists fleeing the country on a daily basis intensified. Many found themselves powerless, especially when the popular demonstrations and protests started to fade away. At a certain moment it seemed that everyone was falling into despair; would anyone listen to those idealists talking about non-violent tactics while weapons were everywhere having the last word? Some media activists covering developments found themselves all the busier, while others were wondering if they had any role left at all. As a result, many fell into inaction and despair, while others chose to shift their activities into the relief sector, psycho-social support, and more recently, education. In the course of the past three years of the uprising-turned-into-civil-war, Lebanon has witnessed the emergence of different groups and initiatives, formed by Syrian and Lebanese youth, who were trying together to contribute to the relief efforts of hundred of thousands of Syrian refugees, in order to fill some of the gaps left by the slow and bureaucratic international response. Syrian refugees in Lebanon. Martin Kurt Haglund/ Demotix. All rights reserved.At the same time, others have continued to work as freelancers with the different media outlets, covering the Syrian event to tell their side of the story. Some of them gradually established a few citizen-journalism news agencies. - Longterm funds to compensate for the ever-dwindling resources in terms of the private donations that they counted on at the beginning of the crisis. - To make the move to a more professional work-style, where they would be able to hire out their qualified members as full-time employees. This kind of qualification was essential if these activists were to survive in one of the Middle East’s most expensive countries. Unfortunately the community of donors and INGOs are reluctant to support those groups, arguing that they are unable to fund “Unregistered Entities”. Gradually, most of the founders of those groups, unable either to return to their country or to afford staying jobless in Lebanon, found themselves forced to seek a better future elsewhere. Many of them are now dispersed all over the world, from Sweden and the Netherlands to Germany and the United States. Most of the INGOs and international donors have instead of supporting such work, implemented projects themselves, and begun to bring their international staff from all over the world to Lebanon, where the government was, at the beginning of the crisis, turning a blind eye to the numerous organizations coming into Lebanon to start up their own projects. But that situation has also changed; currently there is an escalation of resentment among Lebanese officials towards the way many of those INGOs have chosen to work, and many barriers to their work are being erected in the different humanitarian sectors. Moreover, whenever those INGOs want to benefit from expertise in Syrian society, they hire qualified Syrian staff and pay them high salaries, instead of supporting the organizations they originally come from, or helping them to establish new organizations. This has led to an unfortunate brain drain among Syrian civil society organizations, as most of those who managed to survive the funding obstacles weren’t able to maintain their members because of their inability to compete with the INGO salary scales. The consequences could be grave for the future of Syrian civil society when donor-fatigue starts to set in, something expected to happen in 2015. Most of those INGOs wont be able to maintain a low cost operation and will subsequently move to a different crisis zone, probably with most of their trained Syrian staff, while a weakened Syrian civil society will be left alone to deal with the crisis in all its severe consequences. Instead of empowering Syrian civil society and helping it to build its capacity, the aid community is rendering us more fragile. One of the dangerous knock-on effects, is the inability of Syrian civil society to respond to the tensions arising within the Lebanese community towards Syrian refugees. Syrian CSOs have been doing everything they can on this issue, but it is obvious when your organization is barely able to survive day-to-day tasks, and to respond to the basic needs of your people, less time and fewer resources are left to deal with longterm issues such as the social cohesion between refugees and host communities. In Lebanon and in any of the other countries surrounding Syria, Syrian civil society is assailed with a chaos of traineeships, workshops and capacity building opportunities. Theoretically, a huge amount of money has been invested in the last few years in the international response to the Syrian crisis, in building the capacity of Syrian civil society. But practically, most of this money and effort has gone down the drain, as no serious effort was made by the providers of those workshops to coordinate their work. Most of the training went to individuals, some of whom made a career by attending workshops to collect the per-diems and equipment freely distributed to participants, only to leave for Europe soon after, not to institutions or CSOs. In addition, most of what was offered in terms of training did not correspond to the real needs of the Syrians working on the ground, because Syrians themselves were generally excluded from the planning and decision-making process. Although the general scene of Syrian civil society in exile might look dire, the fact is that we already have multiple success stories of organizations who have managed to bypass the aforementioned obstacles and establish themselves as serious organizations. This is something that the international community should build on, learning the lessons that led to those organizations’ success in supporting others. - Donors could be encouraged to launch small-grants programs for unregistered CSOs and grass-roots groups, in order to initiate them into the world of donors, and the way proper financial and narrative reports are produced to document their work and its impact on the society. - Give bigger grants to registered Syrian organizations who can act as an umbrella that supports smaller groups, sub-award them and supervise their work. - Accompany either of the above with a small core-funding grant to help these organisations build a stronger administrative structure. Supporting Syrian CSOs is a direct investment in the future of Syria. These Syrian organizations in general, whether they were working in relief and development or in human rights and advocacy, have a better grasp of their communities’ needs, a deeper penetration of society, and a cost effectiveness which will be much needed in the future. After all it is Syrian society itself that will be expected to lead the rebuilding of the country when the war ends. 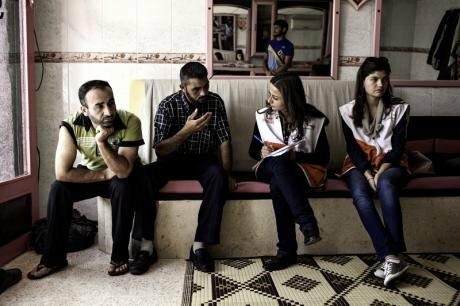 Rebuilding Syria starts with empowering its civil society.